Interests - Thomas the Tank Engine, Teletubies, cars, motorbikes and trucks. 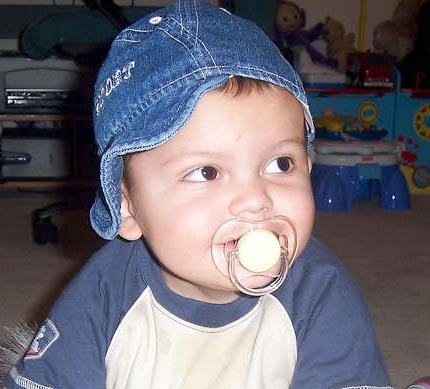 Armani was diagnosed with Neuroblastoma in September 2007. He has stage 2 N-MYC positive so is high risk. He underwent 8 rounds of chemo every 10 days for 80 days. Then he went on to have surgery in January 2008. He has also had a stem cell harvest followed by high dose chemo. He is now on retinoic acid whilst waiting to start 3 weeks radiotherapy. Armani is an inspiration, he has continued to laugh and smile throughout. Armani is now 23 months old and like any other 2 year old toddler. He takes his tablets without complaining and is such a brave little hero. Armani is due to start radio therapy in a few weeks time for 3 weeks, his hair has now come back and he is loving life so much. He is doing remarkably well and we hope and pray he continues to do so. Thank you all so much at Post Pals. Armani loves to receive his very own mail in the post and the surprises waiting to be opened. You are all stars. I would like to thank Hwee hoon, Hayley Thorn, Kate Dee, Sarah, Susan, Laura H, Isobel and everybody else that has sent Armani post these last few weeks. They put a smile on his face every time he opens them. Thank you all so much for your generosity.